It may have a fancy French name, but this dish is all British. Salmon en croute dates back to the 18th century when everywhere in Europe it was all the rage to cover things in dough and speak French. Considering how much the British love things delivered in pastry, this makes perfect sense. The world is a better place thanks to the creation of foods such as sausage rolls, Beef Wellington, meat pies and the presence of the local Greggs on the corner as well as half of what is created on The Great British Bakeoff. 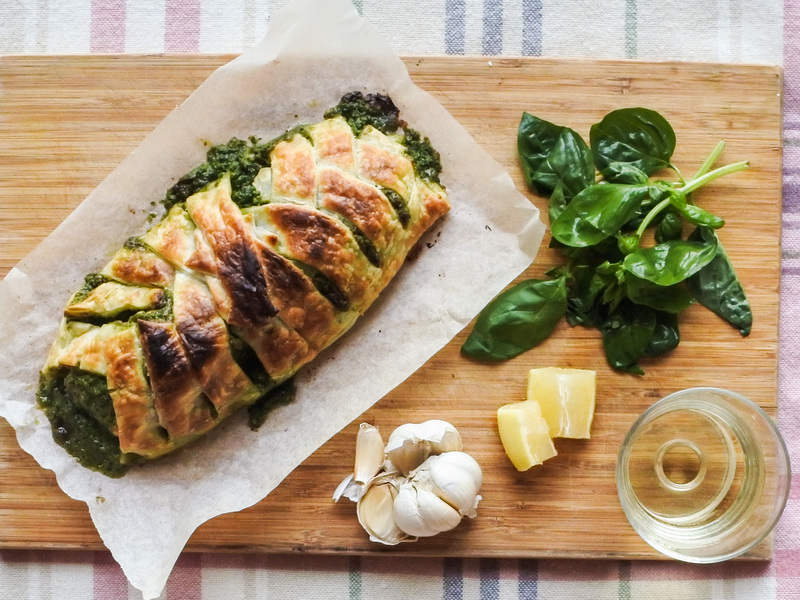 Wrapping things in pastry dough is also a good way to slowly steam whatever is inside with aromatics such as garlic and lemon. The end result is something truly flavorful wrapped up in a pretty package. How often does that happen in life or in our cooking? This dish is perfect if you are having guests over and don’t fancy spending the entire time in the kitchen but still want to impress. This main entree will feed 3-4 guests or 1 very hungry person and the dining companion who watches them eat. In a food processor or blender, puree cream, garlic, lemon zest and basil until smooth. Add a generous amount of freshly cracked pepper and salt to taste (1/2 tsp-3/4 tsp). Set aside. Take out sheet of puff pastry and let soften enough so that it can be folded in half without breaking. Using a sharp knife make 2 in (5cm) deep slits into the outer edges. These slits should be 1 in (2cm) apart. When finished cutting into the pastry, unfold. Place half of the pesto in the center of the pastry sheet and make sure to spread it out lengthwise (try not to get any pesto on the slits as this will make folding it together messy). Place salmon on top of pesto and cover the tops with the remaining puree. Starting from one end, take a side slit of pastry and fold downwards and across in a diagonal direction. Do the same with the opposite side slit until you reach halfway. From the other end, take a side slit of pastry and fold it upwards and across in a diagonal direction. Do the same with the opposite side slit until you reach halfway. When all the pastry has been folded up and is wrapped around the salmon and pesto inside, gently brush the top with beaten egg. Place in an oven in the center rack and cook at 220C/450F for about 20-25 min. I don’t recommend cooking the salmon for longer as it can very easily be overcooked and dry. If you are having difficulty in getting that golden brown color on the puff pastry after 20 minutes, simply place it under the broiler for a minute or two to get color. TIP: The key to getting that crispy pastry on the outside with a perfectly cooked salmon on the inside is temperature. The oven should be hot and efficient in heating and the salmon should be kept cold. Preheat oven to 220C/450F. In a food processor or blender, puree cream, garlic, lemon zest and basil until smooth. Add a generous amount of freshly cracked pepper and salt to taste (1/2 tsp-3/4 tsp). Set aside. Using a sharp knife make 2 in (5cm) deep slits into the outer edges. These slits should be 1 in (2cm) apart. When finished cutting into the pastry, unfold. Do the same with the opposite side slit until you reach halfway.